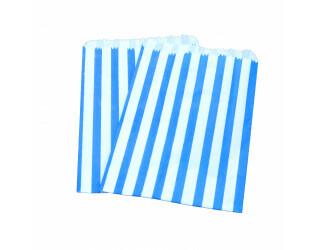 Our Blue/White Striped Paper Bags are made from 40gsm kraft paper, and are printed with a traditional candy stripe design. These versatile bags are 100% recyclable, and use a water based ink, making them a great eco-friendly and economical option for retailers. Our bags are also not strung in bundles, making them easy to use without any fear of damage, tearing, or looking unsightly. The size of these bags make them a perfect option for Sweet Shops, and Craft or Market Stalls, and for a truly eye-catching display, why not pair these with our Pink Striped Bags?